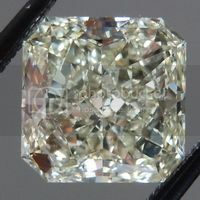 I was thrilled to find this stone. 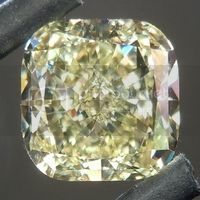 GIA rated as S-T color, light brown. 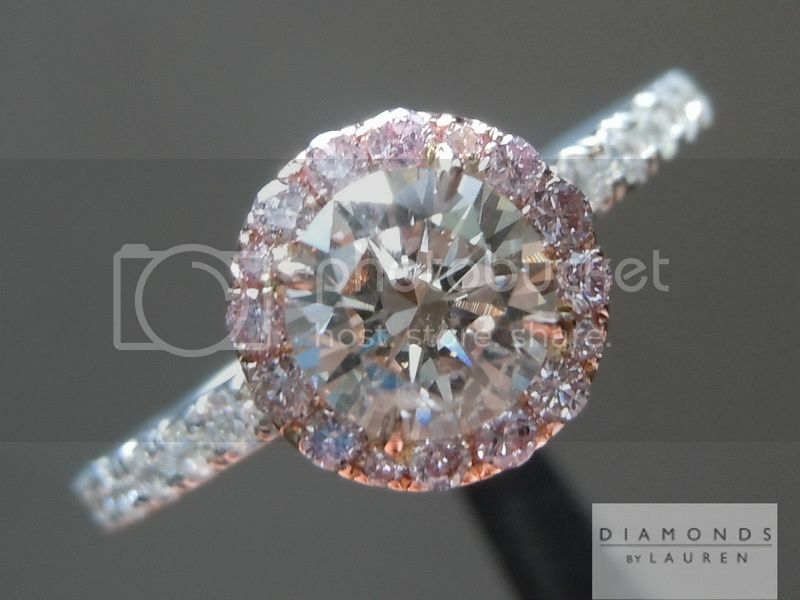 In the best of cases stone like this may show a little rosy pink color under specific lighting – and this is such a case. In brighter lighting cannot really see any of the "pinki-ness". 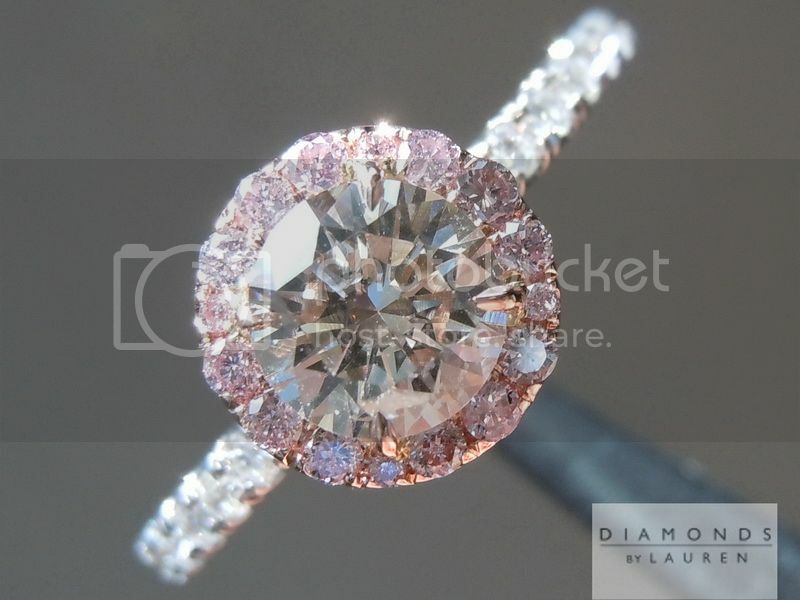 But in candlelight and more dim lighting environments you can definitely notice some pink in the stone. 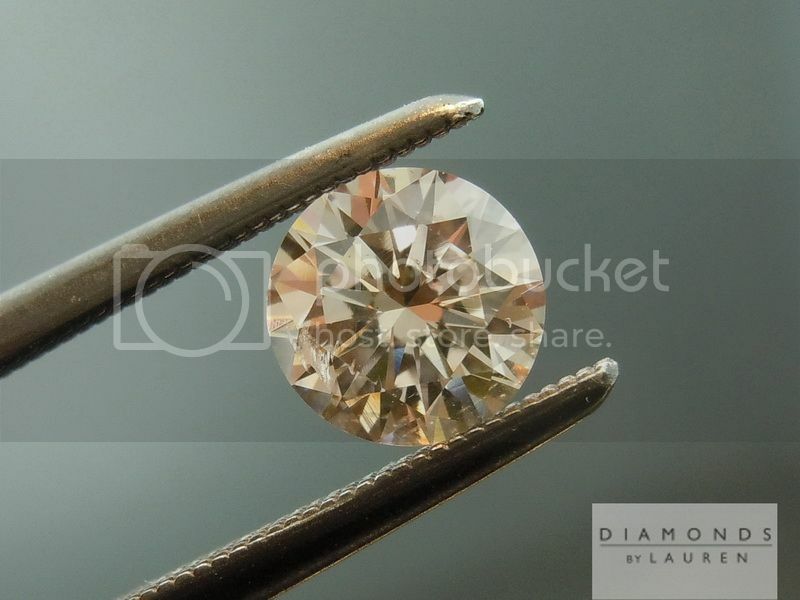 We bought the stone from a diamond trader that picked it up in an overseas market. 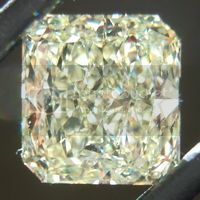 It was purchased from the cutter, without any GIA report. 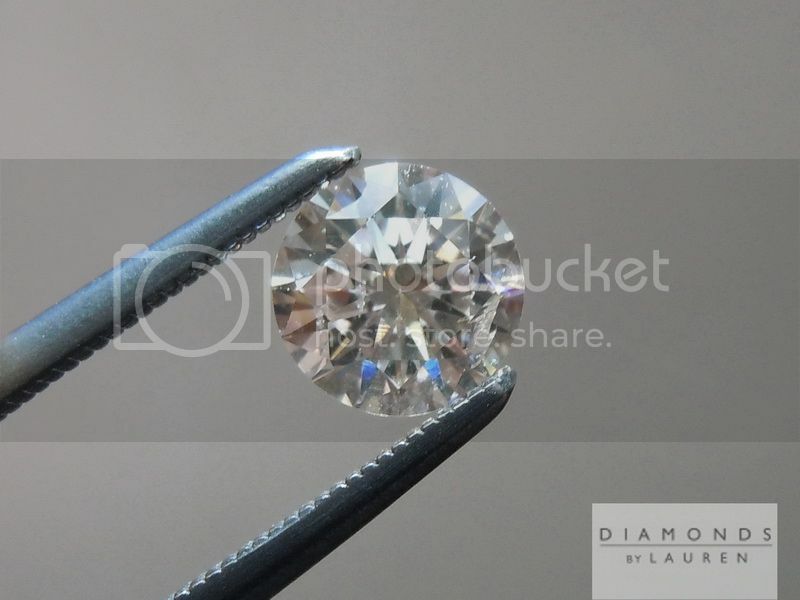 Our friend the trader submitted the diamond here in New York City for a GIA color only report. Personally, I disagree with that strategy as I like to see the full GIA report. 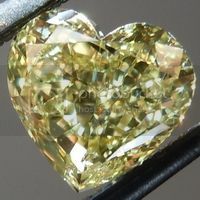 That said, the stone is a hard one to find, and the price is incredible so we bought it. 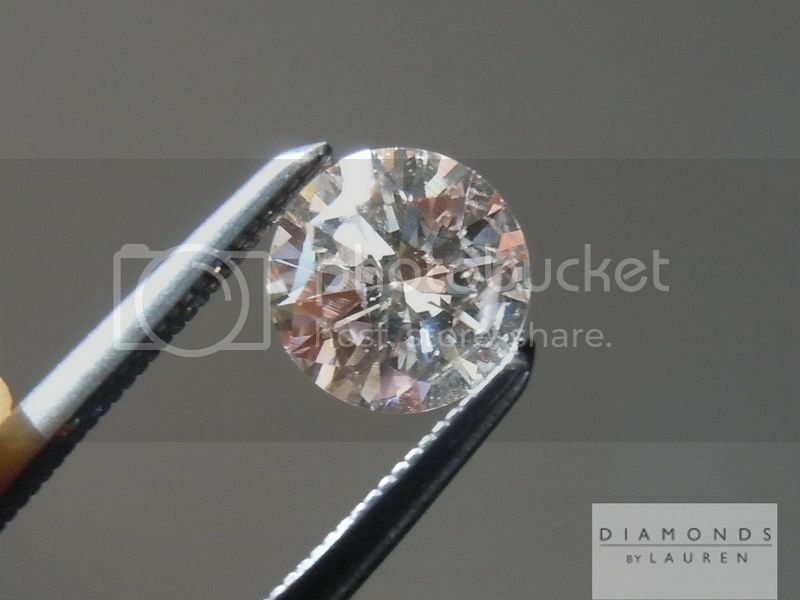 My clarity grade for the diamond is I1. In cases like this where I need to do a clarity grade, I always make sure to err on the side of caution. 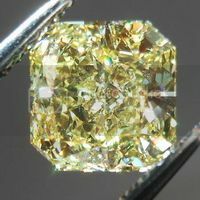 Although I've graded it as an imperfect diamond, I do not believe you will be able to see the imperfections with the naked eye. 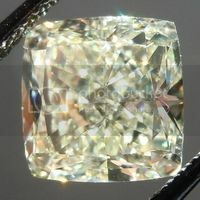 In terms of cut, it is a beautiful stone. 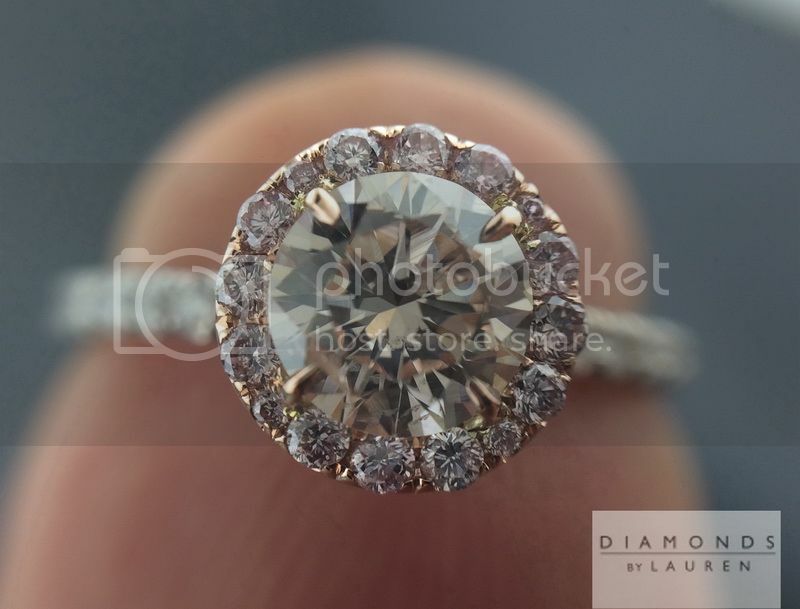 There is a lot of sparkle and even a bit of fire right lighting conditions. 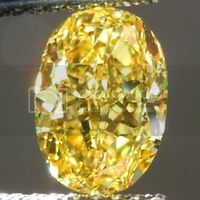 The stone has very good size for its weight – and nice spread. Our more affordable hand forged shop did an amazing job on this one at an amazing price. 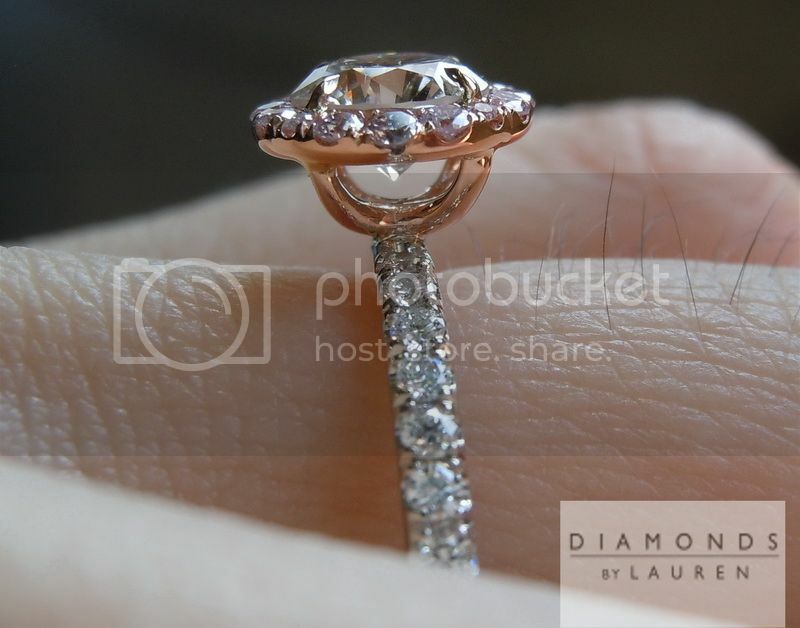 I love the way the pink gold and pink diamonds interact with the light brown center brilliant diamond. 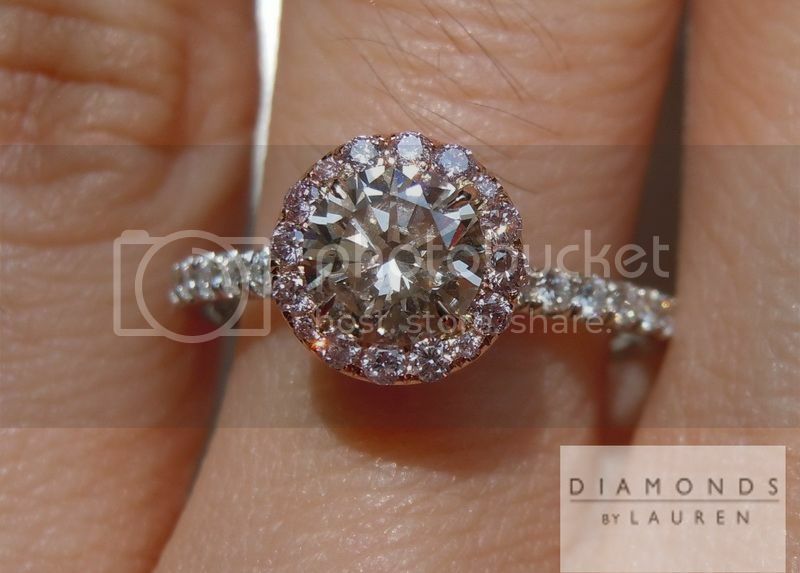 The natural fancy light pink diamonds in the halo are gorgeous. 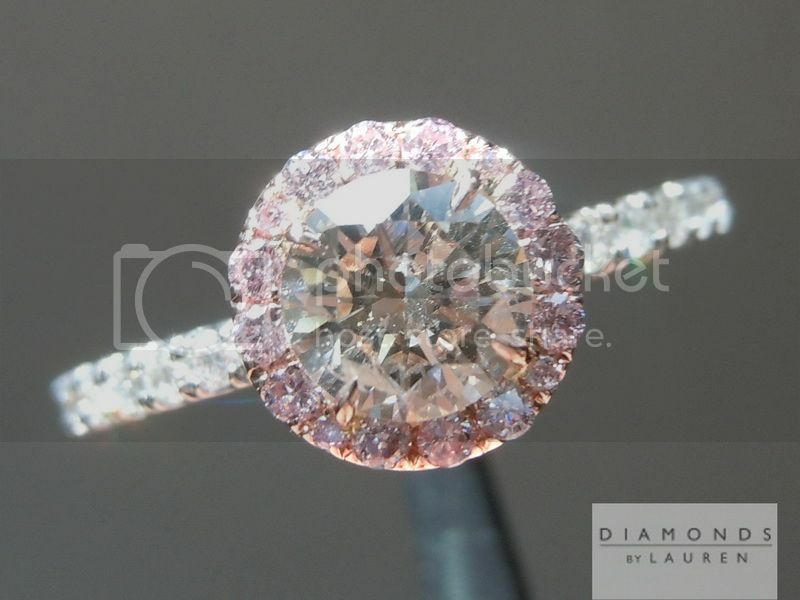 As with clarity on the center stone, there's no GIA grading on the pink melee. 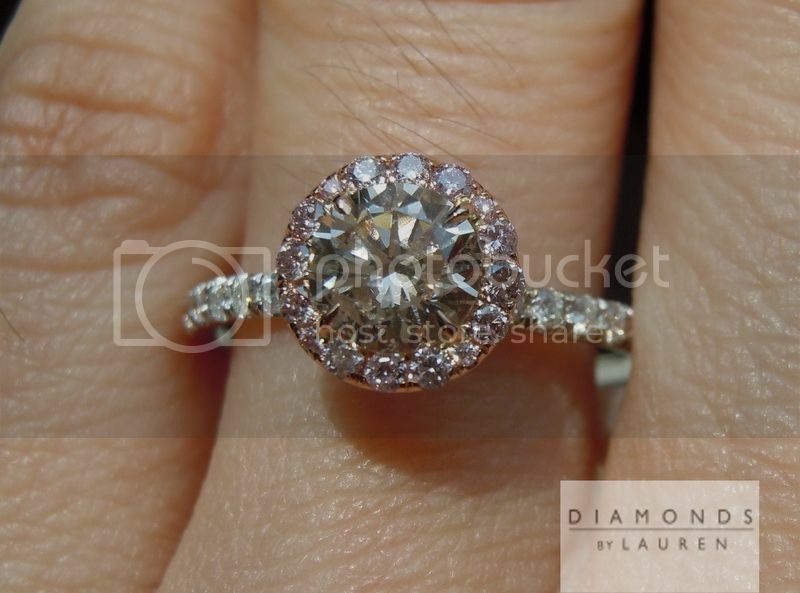 Fancy Light Pink is my grade, given conservatively – as some of them certainly are as dark as Fancy Pink. 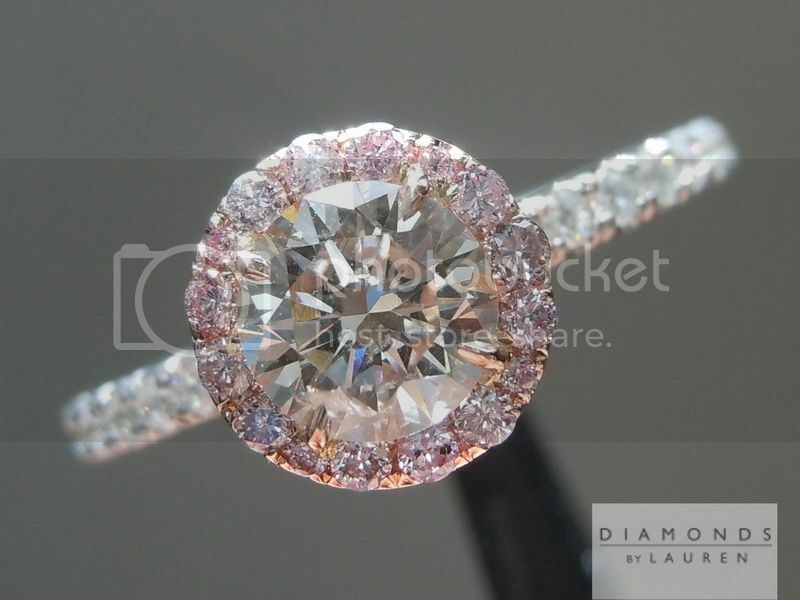 These remarkable tiny pink diamonds are quite costly – valued higher than many one carat stones on a per carat basis. 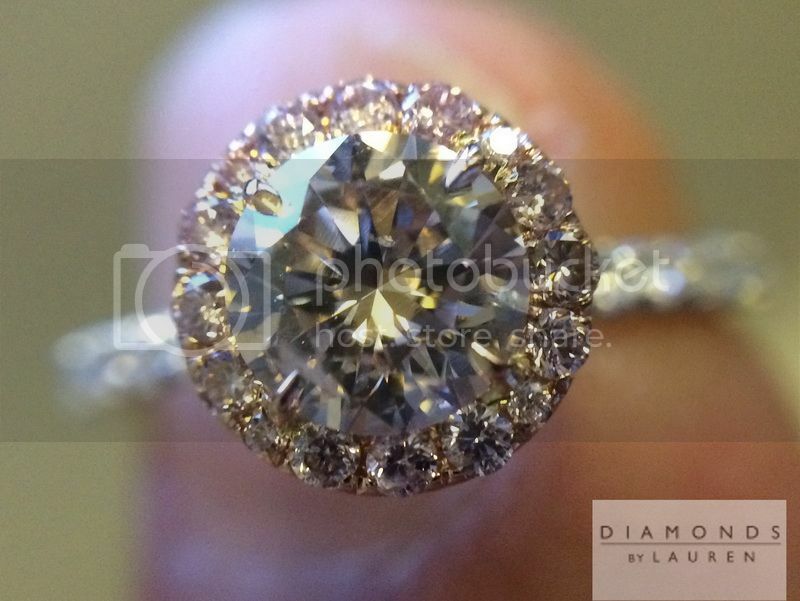 18 karat white gold shank with super brilliant white diamonds rounds out the package. 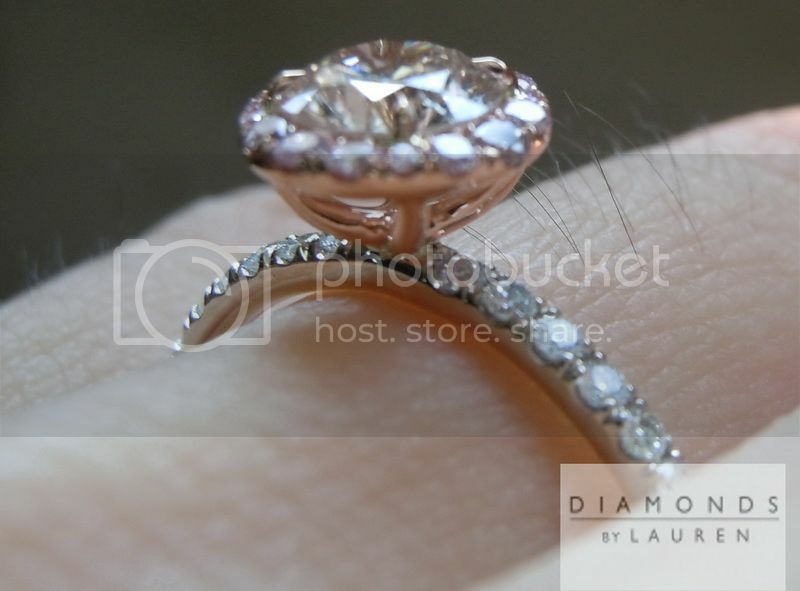 The ring is constructed so that you can wear a straight wedding band flush with it. Great value on a one-of-a-kind piece.